It goes without saying that a baby’s skin is quite different from that of an adult. The skin of a baby is quite delicate and sensitive to environmental changes such as humidity, cold and heat. As the skin forms the major part of the external defense system, it is important to take care of the skin and keep it healthy. Moreover, the hot and humid climate in summer not only damages the skin but also makes it more prone to infections. So to take care of your baby’s skin irrespective of the season, here are few simple skincare tips from our expert Dr. Sanjay Natu, Consultant Pediatrician, Shashwat Hospital, Pune. The skin of an infant changes constantly from being an infant to toddler and adult. It develops and matures through the early years of life. The skin of a baby tends to become functional and develops into a protective barrier at around 20 weeks after birth. It develops throughout the first year of birth. It is during this stage that babies are at risk of developing various skin problems. It could be due to hormonal changes that happen due to growth and development or due to inflammation or an infection. The skin of a newborn loses and gains water more rapidly, has less natural moisturizing factors, and is often dry even though it may not seem so. As an infant’s skin loses moisture two times faster than an adult’s skin, it requires a different kind of care. Here are some key things to keep in mind that will help your baby’s skin stay healthy and comfortable, in spite of the changes in the weather. Bathing is generally superior to washing, provided basic safety procedures are followed. If your baby enjoys more baths, go ahead and increase the frequency to tackle the sweat of the season. However, ensure that the water is warm, not too hot and not too cold to ensure comfortable bath for the baby. Moreover, bathing offers more opportunity for parent-baby bonding which induces calmness and helps the baby to get a good sleep. Your baby deserves the best. Shop for premium baby care products today. Every parent knows that proper skin cleansing can help keep the infant skin free of unwanted irritants which include nasal secretions, saliva, urine, dirt, and microbes. The exposure to such factors for a long period, especially in the diaper region and skin folds, can lead to irritation and discomfort. If this is left unattended, it can also lead to infection. This is the reason why water alone might not be sufficient to cleanse the skin during bathing. Not many people are aware of the use of skin cleansers to keep the skin healthy. Remember that a baby’s skin is 30% thinner, which needs gentle and effective cleansing. Therefore, the right choice of ingredients can enable the parents to provide the baby with mild and gentle care. Hence, it is essential to use cleansers that are milder with pH balanced solution. Opt for products that are sulfate free, paraben free & dye free as these are milder in nature & cleanse gently without disrupting the skin barrier. Use of emollients, which in simple terms mean non-cosmetic moisturizers, during or after a bath is also known to help improve the skin function and stay clean and fresh. The skin of a newborn is soft and sensitive and is slightly dry as compared to adults. This is why it is advised to apply a moisturizer when the skin is wet, preferably after a bath, and pat it dry to keep the skin hydrated. Emollients are known to decrease transepidermal water loss (which is the key reason for dry skin and dehydration), improves skin texture and may even improve skin barrier function. When it comes to picking baby skin care products, less is more. Look for skincare products that are mild, gentle and non-irritant in nature as these can cause less irritation of the skin or eyes. Also, the product should be clinically proven for the absence of any known allergen. It is always wise to do a patch test (apply the product on any area but face for around 24 hours before using it exclusively) to be on the safer side. Ensure that the product does not have a strong fragrance as the chemicals can cause irritation of the skin. Hence, opt for a product which has mild or no fragrance. Pick products that have advanced pH balanced formula as it doesn’t disrupt the mildly acidic pH (between 5 to 7) of the skin. If you have any doubt regarding these products, talk to your pediatrician. 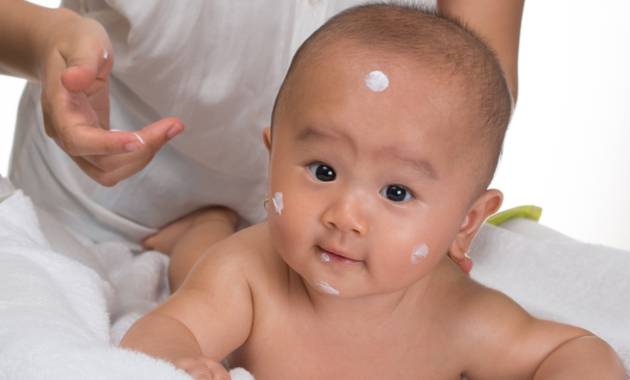 Remember that improper skin care regimen in babies can lead to short term and long term complications. This can cause heat rash, nappy rash, cradle cap, atopic eczema, dry skin or dermatitis. Most of the skin problems are caused due to bacterial infections, environmental factors, and sweat and requires special care and hand. Given the role of a proper skin care routine in kids, it is very important for every parent to be aware of the tips and tricks to keep the skin healthy. Knowing about the right skin care practices and products can help the parents to make the right and best choice for their babies. Stay Healthy, Stay Happy! 1. Telofski LS, Morello AP 3rd, Mack Correa MC, Stamatas GN. The infant skin barrier: can we preserve, protect, and enhance the barrier? Dermatol Res Pract.2012;2012:198789. 2. Skin care for your baby. Paediatr Child Health. 2007 Mar;12(3):245-51. 3. Blume-Peytavi U, Cork MJ, Faergemann J, Szczapa J, Vanaclocha F, Gelmetti C. Bathing and cleansing in newborns from day 1 to first year of life: recommendations from a European round table meeting. J Eur Acad Dermatol Venereol. 2009 Jul;23(7):751-9. 4. Lavender T, Bedwell C, O’Brien E, Cork MJ, Turner M, Hart A. Infant skin-cleansing product versus water: a pilot randomized, assessor-blinded controlled trial. BMC Pediatr. 2011 May 13;11:35.